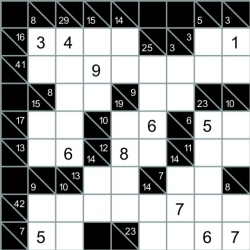 Kakuro is a puzzle and consists of a playing area of filled and empty cells similar to a crossword puzzle. Some black cells contain a diagonal slash from top left to bottom right with numbers in them, called "the clues". A number in the top right corner relates to an "across" clue and one in the bottom left a "down" clue. The objective of the puzzle is to insert a digit from 1 to 9 inclusive into each white cell such that the sum of the numbers in each entry matches the clue associated with it and that no digit is duplicated in any entry. However no digit can be duplicated in an entry. For example the total 6 you could have 1 and 5, 2 and 4 but not 3 and 3. 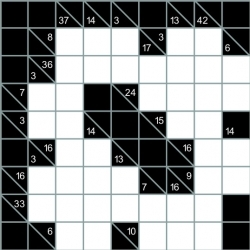 Kakuro is a puzzle and consists of a playing area of filled and empty cells similar to a crossword puzzle. Some black cells contain a diagonal slash from top left to bottom right with numbers in them, called "the clues". A number in the top right corner relates to an "across" clue and one in the bottom left a "down" clue. The objective of the puzzle is to insert a digit from 1 to 9 inclusive into each white cell such that the sum of the numbers in each entry matches the clue associated with it and that no digit is duplicated in any entry. However no digit can be duplicated in an entry. For example the total 6 you could have 1 and 5, 2 and 4 but not 3 and 3.